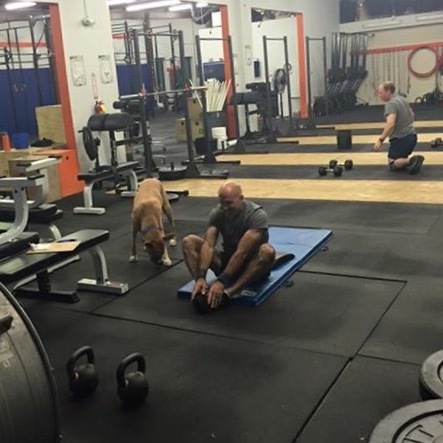 I worked out with the 6am athletes, and it was a full house. Coach Nick admirably led the session. My goal was 165, just 5# less than 1RM. Whilst it did take two attempts do so, I nonetheless achieved my goal. Yay! A new 2RM! Almost everyone achieved PRs, and it was a sight to behold. There were a dozen athletes in the 6am, 5:15 pm, and 6:30 pm sessions, and all achieved new 2RM PRs. Incredible! As all of the 35# dumbbells were in use, I volunteered to use kettle bells. Uhm, this made the workout that much more challenging, I assure you. My goal was to complete all rounds of both activities in unbroken reps and I would’ve achieved this goal if I hadn’t lost my balance on the KBs the very last round. Dammit. I nonetheless worked very quickly, and always completed rows with right (weakest) and then left (strongest) arms. 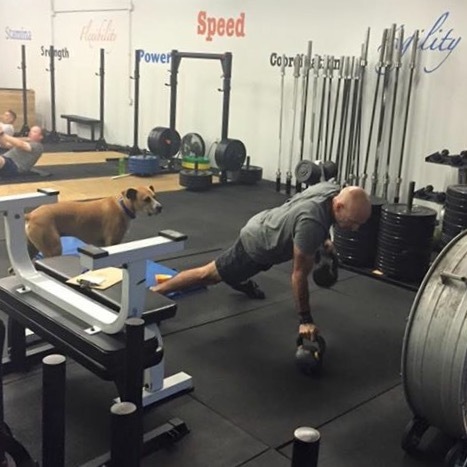 As if often the case, Luke was by my side the entire workout. As we do the first Monday of every month, the coaches met for a workout. Coach Marni programmed and led the session, and it was tough. It. Was. Tough. Uhm, I don’t know what happened the fourth round, and I don’t know how I managed to complete the last round so quickly. 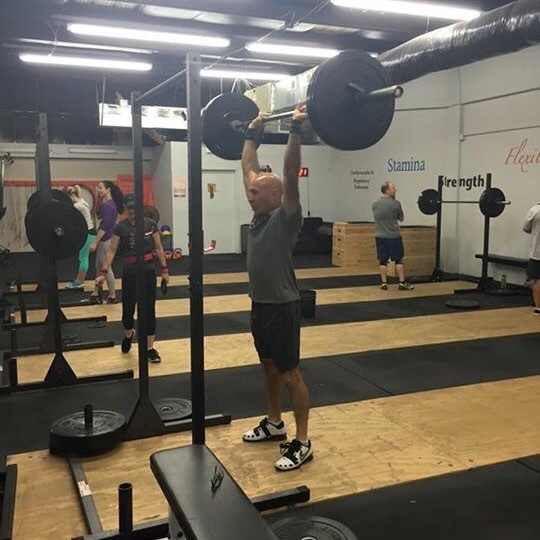 I felt ill-prepared to start, and the first round was rough, particularly the power cleans. Speaking of power cleans, I did each and every rep one at a time and even missed the fourth rep of the first round. I also missed a wall ball shot the first round, but did complete remaining rounds in unbroken reps. 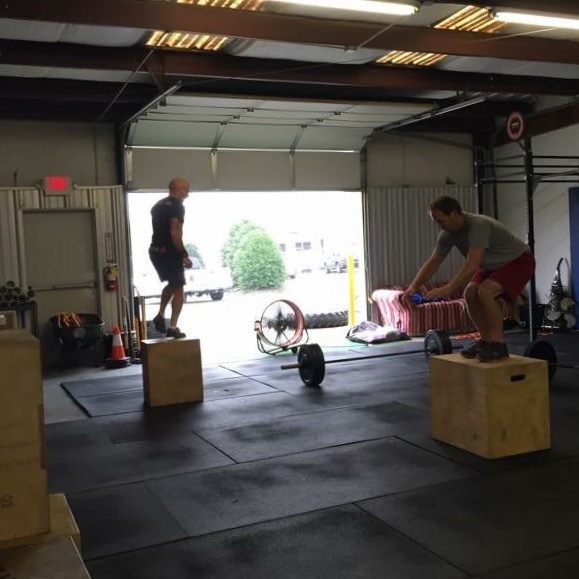 I intentionally missed a few box jumps to see if Coach Marni would correct me (as I often do during Coach WOD). I didn’t, however, count missed reps even if they were done intentionally. I completed all rounds of KB swings in unbroken reps and completed rounds of rowing in 26 strokes or less. Yay! I was a difficult morning due to wallet being stolen. Yup, you read that right. I worked out with the 11:45 athletes. I desperately needed the release. I completed all five rounds of five reps at 125#. Power jerks felt awesome today! What I gasser! I completed all rounds in unbroken reps and focused on resting briefly between activities. Strict toes to bar were just that, and one can only complete so quickly. That’s 90 box jumps overs, 61 deadlifts, and 30 strict toes to bar. Ashton was the only person to attend the 4pm session. That’s unusual. So that she didn’t have to complete the metcon alone I once again completed, although I scaled to 20″ box jumps, 155# deadlifts, and strict knees to elbows. That’s 90 more box jumps overs, 54 more deadlifts, and 27 strict knees to elbows. ‹ PreviousTake me home Country Roads!